Have cruise questions? Seeking advice or information? Look no further, CruiseCrazies is the perfect resource for cruisers seeking information, a place to ask questions, a way to exchange experiences, get great deals on cruises, and a place to connect with other cruisers. I signed up before our first cruise - and was "fully loaded" with information by the time we sailed. From the smallest ideas - like bringing along a power bar to the really big ones - like making a packing list and booking excursions before we sailed. With Spring Break and summer on the horizon, there's no better time than now to begin researching and planning a much needed cruise vacation. CruiseCrazies is here to help. Dedicated to both new and experienced cruisers, the online community CruiseCrazies has recently undergone an extensive makeover boasting enhanced discussion forums , new features, and a completely new look and feel throughout the entire site. Members can now access their profile, private messages, friends, account settings, and more from any page within the site. Have a question about an upcoming cruise? Seeking an opinion or tips from experienced members? The new and improved Discussion Forums now provide more features, user options, and more stability than ever before. "As one of the most popular parts of the community, the forums are the perfect place to ask cruise questions and to introduce yourself," explains CruiseCrazies President Jason Taub. He also notes that "Many veteran cruisers hang out in the Forums, regularly providing advice and information." Browse the enhanced Cruise Reviews directory to read firsthand member experiences and see how members enjoyed the food, entertainment, and more aboard their cruise. All users can post comments, email, download, and share reviews across popular social networks such as Facebook, Twitter, Digg, Buzz, and more. Meet your shipmates before setting sail. The Who's Cruising feature enables users to easily locate shipmates and contact them. In fact, each year CruiseCrazies members coordinate a group cruise and form long-lasting friendships. Jason explains, "It's always exciting to see our members, some who have never met each other in person, join together to book a group cruise to finally meet and share their common interest of cruising together. As our society continues to become more socially connected, it's great that CruiseCrazies helps facilitate such events and connects cruisers from all over." Have you ever thought of packing a bungee cord or duct tape? Well, the CruiseCrazies Packing List and Tips are so extensive that users will be the most well prepared cruisers aboard. The experienced members at CruiseCrazies have contributed valuable ideas to the packing list, and using the list will ensure complete preparedness for an unforgettable cruise experience. Stay connected with the cruising industry! The Cruise News portal is updated several times each week and highlights the latest cruise happenings within the industry. Users can comment, rate, share, and Facebook "Like" their favorite cruise news articles. 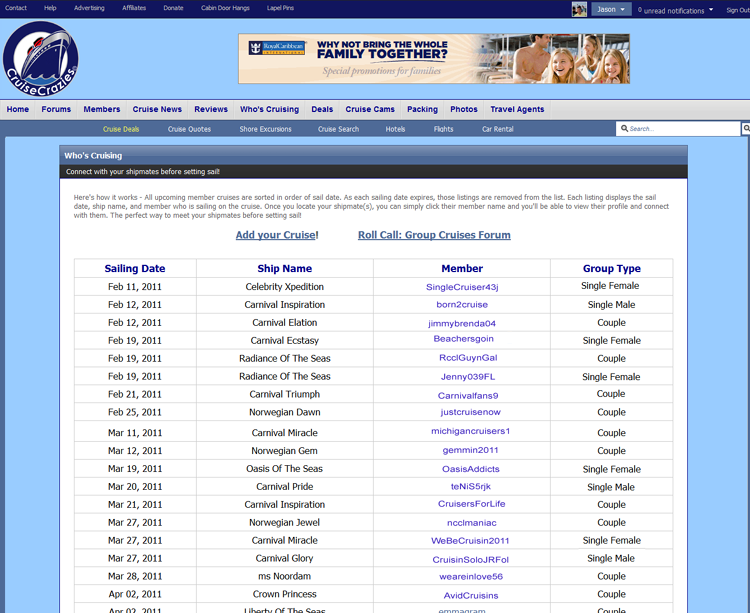 Users can now register or login to CruiseCrazies using their Facebook or Twitter accounts. These accounts can also be linked to a user's CruiseCrazies account so profile photos, status updates, and profile info can be automatically synced across the different sites.... Making it easy for users to update and manage multiple online identities. CruiseCrazies makes it easier than ever to save money. Users can book a cruise, hotel, flight, shore excursion, vacation package, or even a rental car directly through the community. 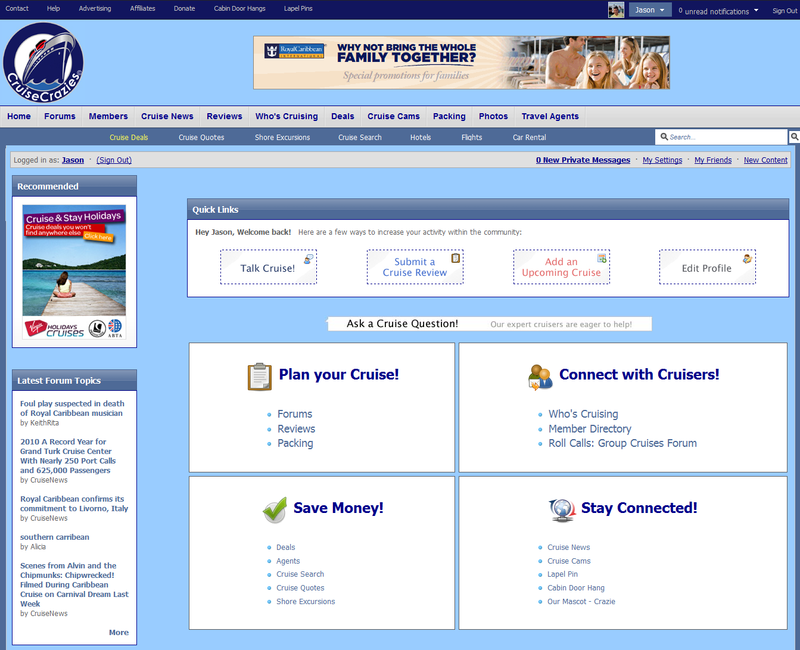 The site has ongoing relationships with a variety of well-known booking engines and Authorized CruiseCrazies Travel Agents who offer competitive rates and are advertised throughout the site. 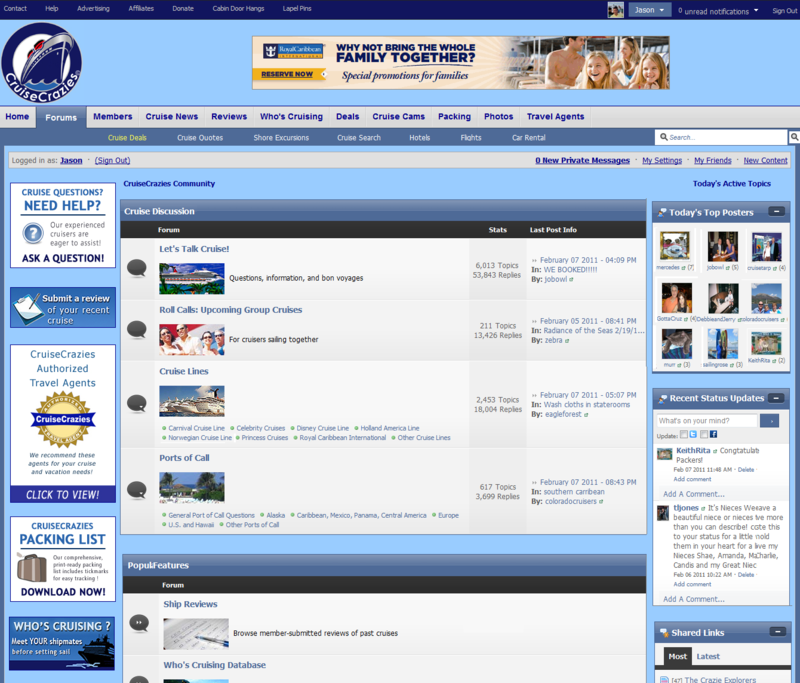 Member Perks at the "Friendliest Cruise Community on the Net!" As you can see, the Ft Lauderdale based website is the perfect resource for all cruisers, and the community has plans for tremendous growth, as explained by Jason. So, what are you waiting for? Sign up as a new member, introduce yourself in the discussion forums, and you'll see why CruiseCrazies is known as "The Friendliest Cruise Community on the Net!"